I am lucky in so many ways, but one of those ways, in my quilting life, is that I live so close to an awesome local fabric shop, Rock Paper Scissors. In fact, I would not be a quilter without Rock Paper Scissors. It is where I took my first sewing lesson as an adult (with Beth, the owner), where I have spent countless hours picking fabric, and where I have hung out if I have a free hour or two for the last three and a half years. It’s also a place where I get to teach and be a part of the awesome family of women who work there. This weekend RPS turns five years old. They are having a party and a sale, and I can’t make it. I couldn’t figure out how to tell Beth, and so I decided to do it in the best and only way I know how. It’s a mini, and it’s not quilted yet, but I’m going to finish it and bring it in next week. But I just had to share with the world in the hopes that maybe you are nearby and can wish RPS a happy birthday for me. The paper pieced scissors are paper pieces from a pattern by Julia Eigenbrodt. The paper is inspired by Elizabeth Olwen’s Sonnet quilt (pattern coming soon from Cloud9!). 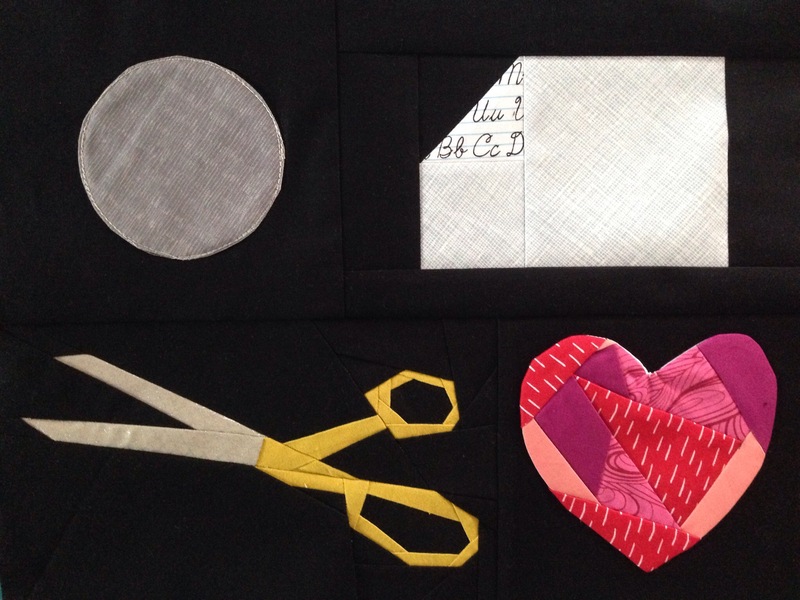 The rock and heart were made with stitch and flip applique. What an inspired tribute. Lovely! What a fantastic tribute; I am sure they are going to love it and know how much they mean to you when they receive it! I’m sure the shop’s owner and her team will be really touched by this sweet and original proof of your affection! An awesome tribute to some beautiful women at RPS! I’m sure Beth will always cherish it! What a sweet tribute! I’m sure they will love it!